This coin set will make a great gift to any American patriot or coin collector (or both). 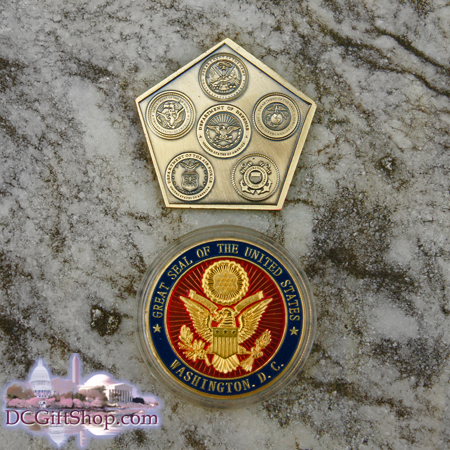 The pentagon-shaped coin has the six seals of the U.S. Military on it: In the center of the coin is the seal of the Department of Defense (formally known as "The War Department") and the five branches of the U.S. Military surround the seal of the DoD : Army, Navy, Air Force, Marines and the Coast Guard. The coin is finished in a burnished brass color. The Great Seal coin features the Great Seal of the United States on one side and the other side is The Pentagon. Both likenesses are rendered in great detail, for example, you can read that the banner being held in the bald eagle's beak says "E. Pluribus Unum." 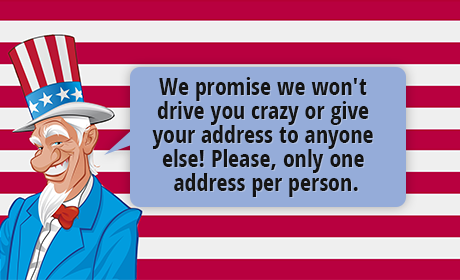 Sign up for patriotic promotions, secret discounts, and our newsletter.